The fall has now officially begun, which means we have the unfortunate task of pointing out to our customers that Christmas is now three months away. Trust us, we don’t want to put a bigger damper on the fact that summer has come to an end, but when you’re in the business of Christmas it’s always on your mind. Even though we’re working on Christmas displays year round (designing and manufacturing new, refurbishing, repairing and cleaning existing) we generally keep the holiday talk within the office. The reason we bring it up now however, is because if you are thinking about getting new displays for the upcoming season we urge you to place your orders now because the Christmas season rush is just around the corner. As you know, we design and manufacture a variety of Christmas displays including modern LED rope lit displays and more traditional décor such as wreaths and Christmas trees. Over the years we’ve mounted displays on walls, poles, roof tops, in the ground and we’ve even suspended displays from the ceiling, so no matter how hard an area may seem to decorate we can come up with a viable solution. Our catalogue of stock designs has continued to grow over the years and now includes a variety of less Christmas specific and more winter themed displays, allowing you to keep them up longer and giving you a bigger bang for your buck. If none of our stock designs are quite what you have in mind, custom displays are also an option. However, as we get closer to Christmas the lead time for custom displays will get longer. Custom displays are something we specialize in and is an option we have offered our customers from the beginning. 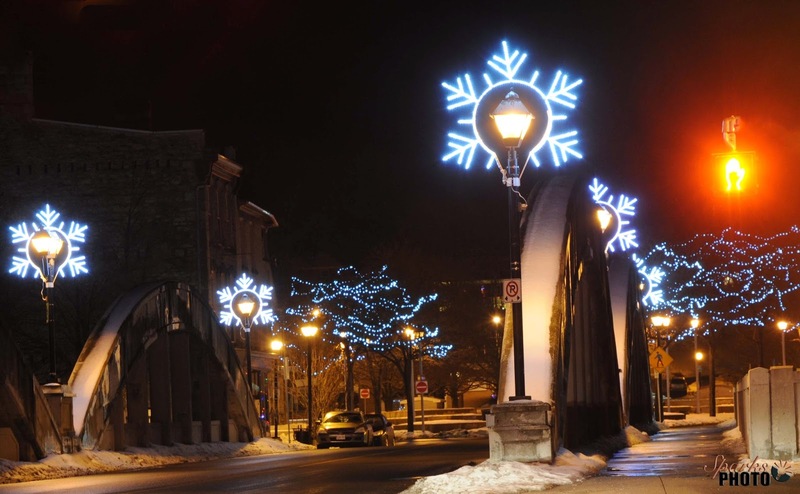 Some of the custom work we have done in the past has included large, animated LED displays for the Niagara Falls Winter Festival of Lights and a variety of pole mount LED logos for various BIAs and Municipalities within Ontario. We understand large scale Christmas décor can be a costly investment, and not something you want to replace every year, so you want to make the right decision the first time around. Regardless of if you’re having custom work done or plan on purchasing stock displays, one of our sales associates would be happy to speak with you to answer any questions you may have and assist you in making your decision. Last year, 239 units had been ordered in the month of September alone and when everything was said and done a total of 520 new units had been produced, which gives you some insight as to how busy our schedule tends to get. That’s why we recommend you order your displays as soon as possible so you have more options to choose from. We continue to accept orders all the way up to Christmas, however the closer you get the more likely you will have to choose only from stock displays and even that will depend on availability. Again, we’d like to apologize for mentioning Christmas and you may now return to your regularly scheduled early fall day.